You know the drill. You’re getting married, and he needs a wedding band. He doesn’t need (or want) anything too fancy, unlike the giant glittery rock you got on your proposal ring. 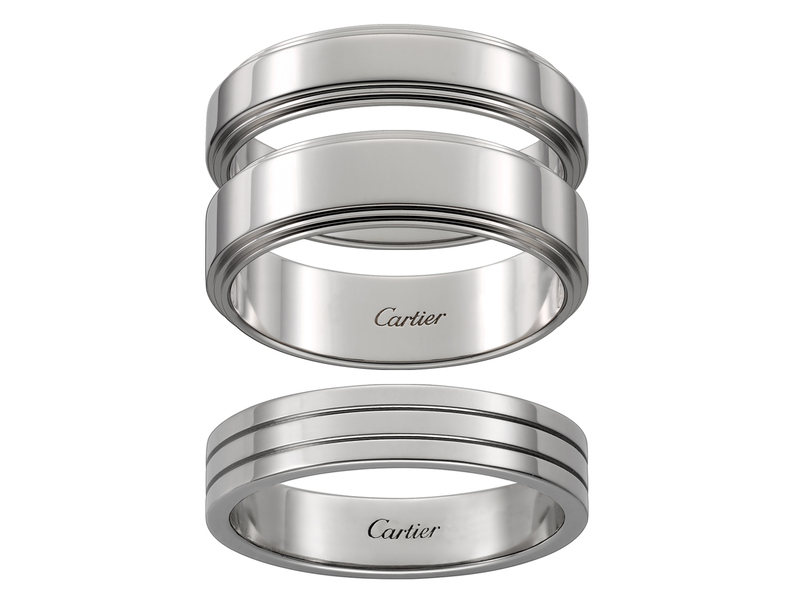 But you don’t want him to be wearing a beer can’s ring pull either, so consider these wedding bands from Cartier the most beautiful compromise. All crafted from platinum (it’s a metal that’s seen as highly resistant and perpetual, one that symbolises the permanence of a marriage), Cartier’s d’Amour wedding bands come in a 5 mm (SGD3350) or 6 mm (SGD4050) width featuring the signature ‘belt’ contour which circles the ring, giving it added thickness and texture. The other piece, Cartier’s Trinity wedding band (SGD2240) features 3 platinum rings melded into a single one, giving it a cool finish with added depth and definitely different from the plain single band wedding bands that’s dime a dozen these days. Simple, sleek yet sophisticated. Just put one of these rings on it.